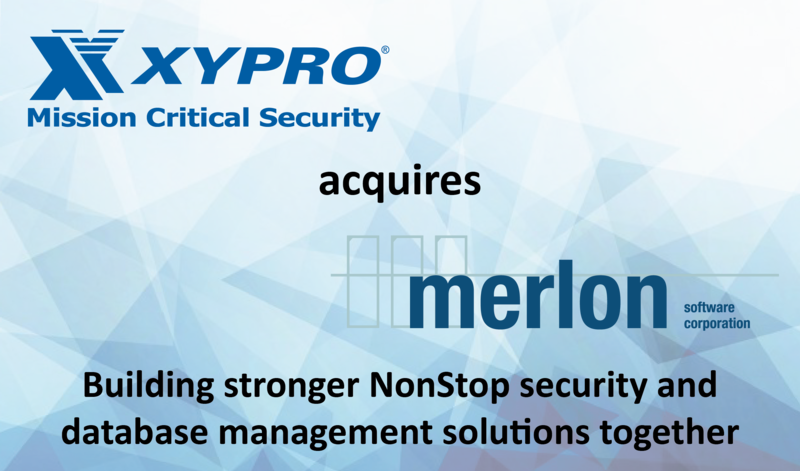 XYPRO® Technology Corporation, the leading provider of security software for HPE NonStop™ server environments, today announced that it has completed the acquisition of Merlon Software Corporation, the leading provider of database management software for HPE NonStop™ servers. In business for over 20 years, Merlon is a Toronto-based company that offers an integrated set of database management tools for HPE NonStop servers, which are fully-integrated, fault-tolerant systems delivering the highest availability, massive scalability and operational efficiency. Many of the world’s leading companies in payments, financial services, retail, telecommunications, manufacturing, and healthcare use Merlon software to manage and optimize their HPE NonStop server databases (HPE NonStop SQL and Enscribe). “Having partnered as the distribution channel for Merlon NonStop Database products for over eight years, this new, integrated company is a natural evolution of that relationship. Merlon products provide companies who rely on NonStop servers for storing and processing vast amounts of data with the means to efficiently administer even the largest, most complex database environments,” said XYPRO’s Kenneth Scudder, Senior Director of Business Development and Merlon’s President post-acquisition. Merlon customers trust its solutions to manage the mission-critical data in their NonStop SQL and Enscribe databases. Together with XYPRO’s NonStop security products, the combined solutions of XYPRO and Merlon provide essential protection and management for mission-critical data. XYPRO Technology offers 35 years of knowledge, experience and success in providing HPE NonStop information systems tools and services. Businesses that manage and transport business-critical data on a large scale turn to XYPRO for the very best solutions in Security, Risk Management, and Compliance. XYPRO’s software solutions ultimately enable businesses to protect information assets and gain a competitive edge through improved efficiency. Merlon Software is a Toronto-based software vendor specializing in modern, functional Database Management software for the HPE Integrity NonStop line of servers. Merlon products increase availability, reduce complexity and maximize investment of the highly available, fault-tolerant NonStop servers.